If you are like me you LOVE LOVE before and afters. This table we scored where most of us New Yorkers get our furniture... on the curb. There is way too much wood in my house of all unmatching colors, so recently I decided to redo the living room and start with this table. I painted the top and then cut up this old nautical chat we found on our boat that belonged to the previous owner and used modge podge to affix it to the top. 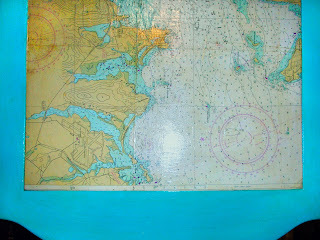 Its cool because our boat's mooring and area we will be sailing the most is on the map. The next thing I did was to buy a new rug. Its black and white. Im hopeing to brighten up the room and I am also going to sew some new pillow duvet covers for the couch. Pictures to come!!! Yeah you already know how awesome I think that is. I can't wait to see everything come together! This is awesome. Can you share these before/after pics on www.widwi.com? widwi = "what i did with it" and is for before/after pics like this. good work. ps - love the sock puppet. Yes i just did! Thanks for the tip on that website!